Today, Pope Francis welcomed Palestinian president Mahmud Abbas in a private audience at the Vatican—just a week before the scheduled visit by Israeli Prime Minister Benjamin Netanyahu. The visit of these two leaders coincides with reports that the pope will visit the region next March—possibly with Bartholomew I, the Patriarch of Constantinople. Given his magnanimous style and deep concern for the poor, might Francis follow the example of Francis of Assisi and work for peace and dialogue in the Holy Land? And will he be more successful than the recent efforts by Obama and Kerry in brokering a lasting peace deal in the Holy Land? I would argue yes, and here are a few reasons why. Second, Francis has displayed a strong commitment to peace in the Middle East. In September, he led the world in a historic prayer vigil and fast for peace – possibly preventing an American-led military intervention in the region. A key question will be if Francis can inspire and mobilize the Catholic and political community in the United States to seriously work for a two-state solution. American Catholics can be an important counter-weight to powerful evangelical Christian lobbies that are dogmatically against the creation of a Palestinian state. During his visit to the Vatican today, Pope Francis gave President Abbas a pen. 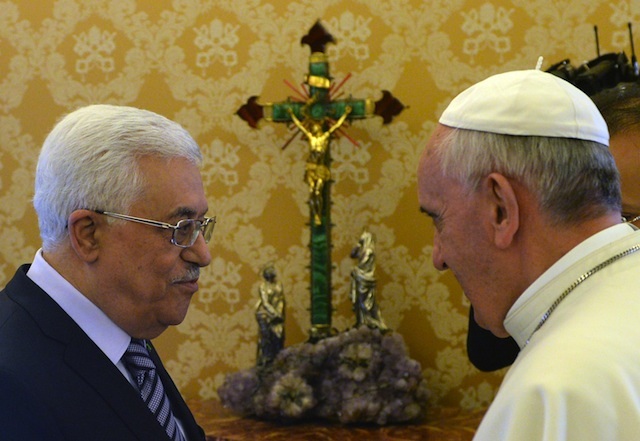 Abbas told the Holy Father that he hoped to use the gift to sign a peace agreement with Israel. “Soon, soon,” the pope responded. Let us hope and pray that Francis is right.